This house – or temple – is in the remote town of Antonito, Colorado. We passed through there in March and I thankfully saw it from Highway 285, even though it’s maybe half a mile from the main road. I was amused at the arch across the entrance: “ALCOHOL+TOBACCO IS KILLS” and “MARY JANE IS HEALING.” The creator of this western Graceland is or was quite prolific. Every surface of both spires is ironically covered with the ends of beer cans. Thanks to Wikipedia, I discovered that this is “Cano’s Castle,” built by Donald “Cano” Espinoza. 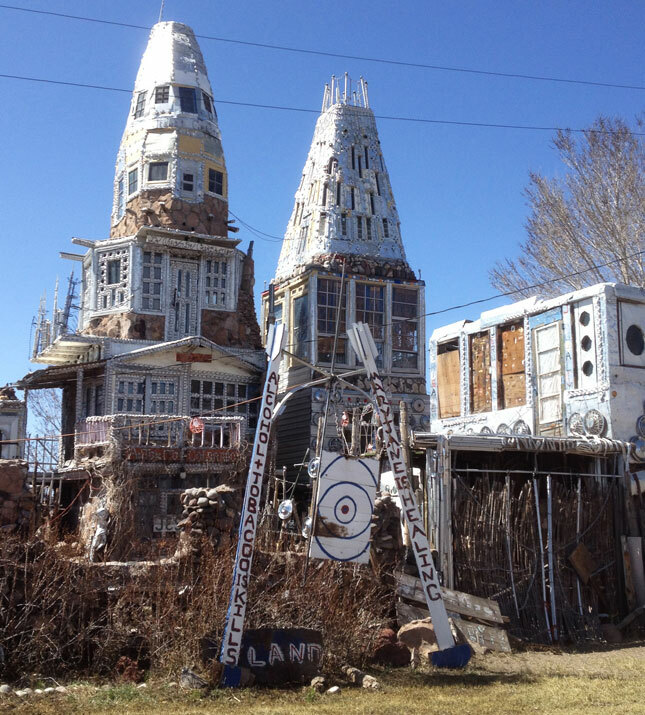 … She said Cano’s Castle reminded her of Watts Towers. Watts Towers came to my mind as well, but the Towers were quite solidly built. These look more improvised.